Feel like copying Arnold by carrying a Desert Eagle for your everyday carry weapon? This is probably the stuff you want to have in your magazine. 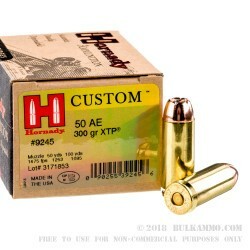 The Hornady Custom 300 grain XTP load that is all factory Hornady components is something of a special round for its quality and consistency. 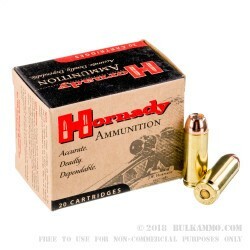 Yes you pay a premium, but you’re getting something that few manufacturers can match out of factory ballistically, but also the reliability and reputation of the Hornady name when it comes to personal defense and general ballistic performance. A fantastic 1475 fps velocity at the muzzle and a nearly flawless reliability factor in guns that are already a bit touchy like the desert Eagle, this is a round that you can count on with your life if you need to. 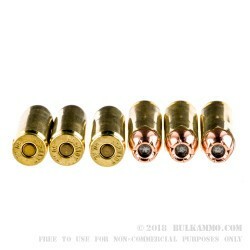 The brass case is a premium heavy casing with a Boxer primer so reloading is possible easily; and the tolerances and load consistencies on the ignition and on the functionality side are beyond what most manufacturers are doing. Pair that with a very clean powder charge and you are already starting to justify the premium price point for the cartridge. The cleanliness alone is something that can change the outcome in a self-defense scenario in seconds; it also takes the huge headache away from range fiddling when your gas system is clogging up prematurely and requires tools to clean before you can shoot again. 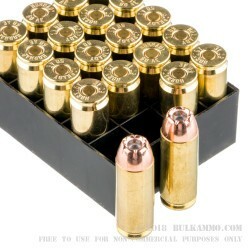 This is a premium round for those who want no compromises in .50AE.